Of all the planetary elements associated with Western Astrology the Sun is probably the most important in terms of significancy. Where the Sun's position is within its one yearly cycle at the time of birth determines the personal designation of one of the twelve astrological star signs. The Sun's location and influence is believed to mainly affect the prominent ego and mannerism characteristics of an individual personality. This is why most people are aware of, and know a little about, their main allocated Sun Sign in Astrology. The settings of other planets and stars may have an effect in other areas of a person's character but the Sun always dominates their self identity. The Sun is the brightest of stars that is centralized in the Solar System and possesses an almost spherical shape. It is made up of a range of red hot gases and magnetic fields and its diameter is over 100 times that of the Earth. The Sun is easily seen with the naked eye and has been celebrated since the beginning of time and by many cultures. It is no surprise that it was chosen in Astrology to symbolize the central point from which all births can be plotted to build up a horoscope. Without the Sun's guidance and strong significance it would be much more difficult to interpret an individual's zodiac mapping. It has been utilized as the easiest method of identifying a persons character traits and gaining a keen interest in Astrology. There are many myths concerning the Sun and various significant references to it throughout history. They help reinforce the inspiring symbolism of the Sun and its connection to our daily life. The most well known mythology associated with the Sun is probably about the Egyptian Sun God Ra or Ree. He was referred to as the creator of the world and worshipped and feared but highly respected. The ancient Aztecs believed that their Sun God Tonatiuh was the fifth generated Sun, believing the previous four Suns had died at the end of each cosmic period. These are just two among many beliefs in the power of the Sun's imprint and impact and so trusted guidance from Astrology. In Greek and Roman mythological references Apollo was known as the God of light with reference to the Sun and who could predict the future. The Navajo Indians of North America call their legendary Sun God Tsohanoai and imagine that he carries the Sun on his back by day as he crosses the sky. At night he is thought to cutely hang the Sun on a special peg in his house. Legends and myths about the Sun like these focus attention on the meaning and importance of its impressions on astrological ideologies. It also directs us to entrust in the judgments of people of the past and use that belief and knowledge within Astrology today. A persons Sun Sign is considered to be the backbone and a basic indicator to the rest of their astrologically influenced character. The Sun presence in a horoscope reading is thought to highlight the major strengths, weaknesses and possible traits within personalities. It reveals the determination, way of thinking and motivation of an individual and forms the basis of their probable nature. The alignment of the Sun when you are born can indicate any likely significant abilities and personal attributes. This unique positioning can give an indication of your suitability for many of life's challenges including career choices and personal relationships. The significance of the positioning of the Sun in any horoscope provides a starting point for analysis. The Sun is represented in Astrology by a symbol of a circled dot. The circle is assumed to represent the divine spirit and the dot is meant to signify the seed of potential. This symbolic representation is an excellent and simple way of understanding the impact of the Sun's influence on personalities. It portrays the whole person and also their inner possibilities for achievement. This is the reason why Sun Sign personality predictions are so uncannily accurate because they disclose the most outstanding noticeable areas of peoples characters. The Sun in astrological terms is said to be ruled and driven by the sign of Leo bringing along with it vitality, courage, loyalty and confidence. In the natal chart it can show us our egotistical traits, inner self emotionally and some degree of directional sense. The Sun in a horoscope inspection is envisaged as a mini plan to our destined purpose in life and as a generalized guide to our main personality assets. It grants us little clues that help us comprehend ourselves more effectively and so gain more from the many opportunities that life can offer. By being aware of the Sun's connotations on Astrology charting and the origin of these assumptions we can usually understand them better. The center of the sun is very hot (about 15 million degrees Celsius) and the pressure is immense (about 100 billion times the airpressure here on Earth). Because of that, atoms come so close to eachother that they fuse. In every second, the Sun spends 700 billion tons of protons (or: Hydrogen) in this way. And only a small fraction (0.7 percent) is turned into light. Right now, about half of the amount of Hydrogen in the core of the Sun has been fused into Helium. This took the sun about 4,5 billion years. The photosphere is the thing you see when you look at the sun. The chromosphere lies just outside the photosphere, and is almost completely transparant.The temperature in the chromosphere rises slowly as you go further out; from about 4300 degrees to 8300 degrees at the edge. At that point, the temperature rises sharply. The corona begins at the top of the atmosphere. Because the corona is so thin, you can only see it during a solar eclipse, when the glare of the Sun itself (its photosphere) is blocked by the moon. The temperature of the corona is very high: About a million degrees. It is so hot that it emits light at X-ray wavelengths; the picture to the right is an `X-ray photo' of the sun. It still isn't well known how this can be: How can the surface of the sun be `only' 6000 degrees, while the area about it is much hotter? It probably has to do with the complicated magnetic fields of the sun, but the last word hasn't been said about that. A constant stream of particles flies from the sun, with a temperature of about a million degrees. They fly with a velocity of about 450 kilometers per second, and this solar wind reaches out to at least the distance of the Voyager 2 space probe, and that is beyond Pluto's orbit at about 5914 million kilometers. The origin of the solar wind lies in the Sun's corona. The solar wind blows gas and dust oozing out of a cometary nucleus backward, creating the characteristic `tails' of comets. To study the solar wind, the European space probe Ulysses has been launced. Due to its unique orbit, it can for the first time study the north and south polar regions of the Sun. It has shown that the solar wind is very irregular, and much faster near the polar regions of the sun than at equatorial latitudes. Besides the fact that the sun heats up the Earth, there are a few other clear influences. As we saw already know the number of solar spots isn't constant in time. In fact, between 1640 and 1700 there were virtually no sunspots at all. That period coincides with the `little ice age': It was much colder in that era. This might be coincidence, but it might also be causally related. This is yet unknown. The Skylab satellite has measured how much energy the Sun radiates in total. That too appeared not to be constant, but variable with a few tenths of percentage points. This can have an influence on earth's climate. 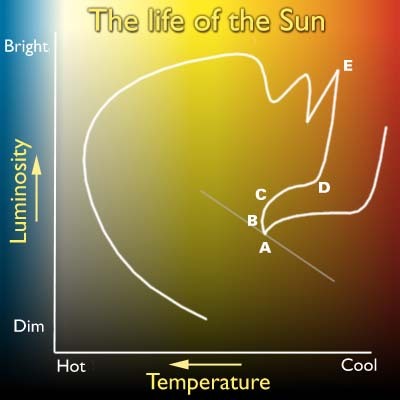 In this diagram you can see how the temperature and the luminosity (that's the amount of light radiated, or brightness) changes during the life of the Sun. Astronomers use these types of diagrams a lot, and they are called Herzsprung-Russell diagrams after the two astronomers who invented them. A At point A, the Sun starts nuclear fusion in its core. This can be called the `birth' of the Sun. B At this time, about half of the supply of Hydrogen has been used up. This is the situation right now. C The Hydrogen in the core of the Sun has all been used, and the fusion of hydrogen in a shell around the core starts. This makes the sun swell up: Its radius becomes about 40% larger and its luminosity twice as bright. D One and a half billion years later, the surface of the Sun is 3.3 times the size it is now, and its temperature about 4300 degrees. As seen from earth, the Sun will look like a big orange disk. The problem however is that the temperature on earth has increased by about 100 degrees because of this. So all the seas will have evaporated by that time. It can be seriously doubted if any people would survive to see this spectacle... Within 250 million years, the Sun will grow 100 times larger than it is now, and 500 times more luminous. From the lava-seas of the then molten earth, the Sun will take up almost half of the sky. What happens after that is not well known at this time. The sun will become brighter, and the outer layers will be blown out into space in the form of a very dense solar wind. This is what is called a planetary nebula, and an example of this is seen to the right. After that, only a white dwarf remains, with a mass of about half of the mass of the current sun, but with an enormous density of 2 tons per cubic centimeter (imagine compressing a car or two into a thimble.. ). This white dwarf will slowly cool down. This is the end of the solar system: A black dwarf, with the ashes of the planets circling around it. But that's a long time from now!! pollo was the son of Zeus (Jupiter) and Leto (Letona). He was the twin brother of the goddess Artemis. He was the god of the Sun, logic, and reason, and was also a fine musician and healer. The aspects are wonderful for you this morning. This is an active day, during which the horizons of your ambition are expanded. Traveling is discouraged, but thoughtful shopping could be quite successful. Share your abundance with those who feel left out in the cold. An excellent day for personal interests and for seeking the things you feel you need. You are magnanimous, but vanity and false pride rear their heads later in the day. Pressure and fatigue are indicated toward midnight. Budgets, cost accounting, banking matters, rents, leases, mortgages, insurance, and shopping are all ideally stimulated today. Heady feelings can develop as dusk advances. It could be disastrous now to flirt and tempt fate. Be cautious with money today, but stop short of being a tightwad. Your awareness and intuition are strong this morning.